Nigeria and Israel are considering areas of partnership to forge an alliance to thicken the fight against cybercrime and foster a crime free cyberspace. This was made known during a recent visit of a team of three representatives from the Israeli Embassy to the Nigerian Communications Commission (NCC) in Abuja. The meeting explores areas of collaborations to address cybercrimes on the rise as a result of increasing pervasiveness of the internet and internet enabled devices. More than 0.80% of Nigeria’s GDP is deemed to be lost to cybercrime while $649 million is lost to the menace annually. A 2011 World Bank Survey revealed that Nigeria along with Cameroon, Ghana and South Africa were listed among top 10 countries in the world with a high level of cybercrime prevalence, even 45.3 percent internet users in Nigeria suffered attack from cyber crooks in the third quarter of 2015. However, with a robust cyber security framework that will curtail the excesses of the cybercon-men in place by the government and institutions, the menace can be put in check, while ensuring national security of citizens and businesses in the country. The Director Africa Department II, West and Central Africa, Barnea Hassid who led the team from the Israeli Embassy informed the Executive Vice Chairman of the NCC, Professor Umar Garba Danbatta that they were at the NCC’s headquarters to discuss areas of collaboration and interest to the regulatory agency, importantly cyber security and how to address issues of cybercrimes. The visiting team also had the Deputy Chief of Mission, Embassy of Israel Abuja, Nadav D. Goren and Senior Economic Officer, Embassy of Israel, Florence Osuji. Hassid said cybercrimes result from convergence of Internet devices, hacking of online financial transactions and channels of electronic transactions, online impersonation and terrorism which utilizes internet to connect members globally. He said that the Embassy has already met with the Nigerian Governors Forum and discussed matters of importance that require government attention and bilateral agreements between the two countries. 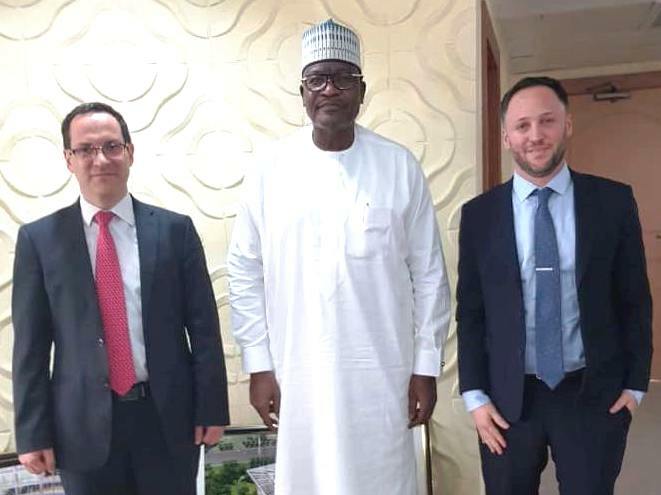 While commending the team for the bilateral relationship between the two nations,Professor Danbatta said the NCC will welcome any partnership to mitigate challenges of cybercrime, security and privacy matters in the app sector of the telecom ecosystem to address impersonations and safety nets to manage online media database. He further stated that one of the commission’s 8- Point Agenda is focused on facilitating broadband penetration and ensuring 30% penetration by end of 2018. According to Danbatta, that this will not only bring unprecedented developments and growth in the telecoms sector, but will also produce challenges due to innovative applications that will require expertise and networks professionals to handle. Hassid said the Israeli government will provide training to staff of NCC tailored on the collaborative areas, while also extending an invitation to Professor Danbatta to be the guest speaker at the event.